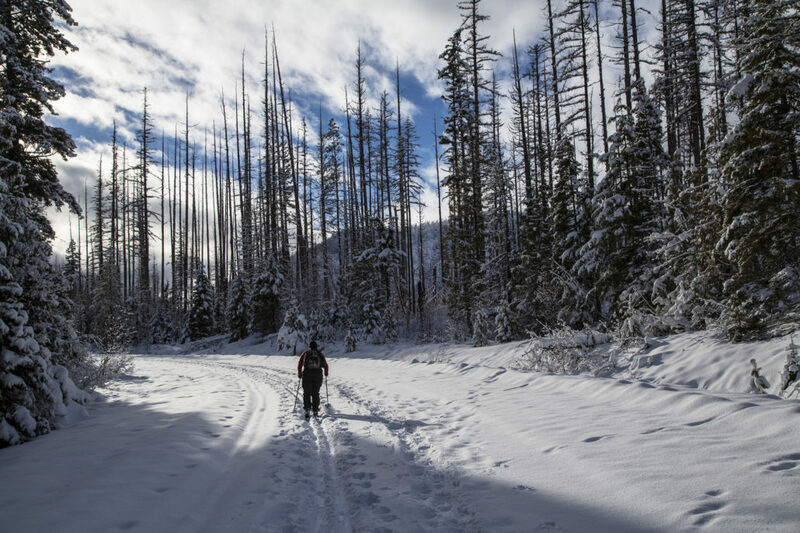 One of the highlights of visiting Glacier National Park in winter is getting to take advantage of the snowy trails, open to snowshoers, cross country skiers, and outdoor-lovers of all sorts. Work up a sweat and check out this sampling of routes on the west side of the park, ranging from beginning to advanced. Layer up and hit the trails to enjoy a day sliding through a quiet wilderness winter scene. To check on trail conditions and road closures, call the park service at 406-888-7800 or check their website before heading out. A great option for young children, this 3-mile loop heads around a natural meadow in the Polebridge area, an outing with level terrain and a taste of the North Fork area of the park. Trails start from the Polebridge Ranger Station (closed in winter), and skiers should check road conditions before driving the unpaved road. From parking in the Lake McDonald Lodge parking lot, ski 1.8 miles up the unplowed road to Lake McDonald Creek, turning left to ski to the bridge over the creek to take in the view of McDonald Falls. Cross the bridge and ski right, continuing on to Sacred Dancing Cascades and back to the road, in a 5.3-mile round trip. For an ascent that offers a challenge, this 10.6-mile round trip trail to Apgar Lookout offers a hearty workout that pays off big in amazing views of Lake McDonald. Park in the lot across from the barn and continue up beyond the end of the plowed section across Quarter Circle Bridge and up the hill. Take the right fork and continue half a mile until the marked trailhead, then head up the slope for the Lookout views! Our front desk staff would be excited to recommend outfitters for gear rentals, as well as other ski trails in the park. Reserve your room here at the Historic Tamarack Lodge & Cabins for the winter mountain getaway of a lifetime!